Is it time for Canada to dive into the “Blue Ocean” thinking? 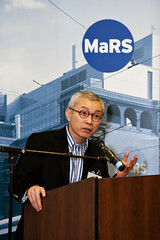 This week, MaRS hosted prof. W. Chan Kim of INSEAD (one of the world’s leading and largest graduate business schools, who also co-founded and co-directs the INSEAD Blue Ocean Strategy Institute) on his first official visit to Canada and his introduction to MaRS. For the uninitiated, Blue Ocean Strategy is the systematic pursuit of new market and new demand creation through the simultaneous pursuit of higher value and lower cost. It is called Blue Ocean because of its focus on creating unknown market space where you do not compete head-to-head against the competition but rather out-compete them by creating new markets where no competition exists. The current tumultuous global economic environment was a hot topic during the reception. Is there a unique opportunity for Canada, and how can we capitalize on it? Dr. Chan Kim, the “Admiral of Blue Ocean Strategy” seems to think that this is indeed the case. The Canadian economy is hurting, but not nearly to the extent of other developed economies, such as USA and Europe (Bloomberg: Canada – World’s Best Financial System). As such, at present we are uniquely positioned to take advantage of opportunities in the shifting global markets. All we need to do is to be precise about connecting a few great product ideas to markets and get the right people to pilot these innovative companies. MaRS has already built the enabling infrastructure, which places us right at the gate. The same way as a Cirque de Soleil became a symbol of Canadian creative talent in the eyes of the world, MaRS is well positioned to be a launch pad for future global enterprises stemming from Canadian innovators.